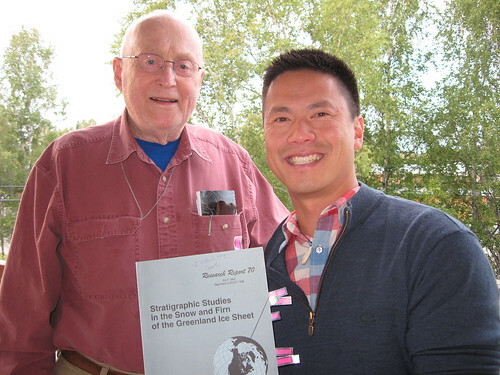 In the summer of 2012, I had the fortune of meeting up with Dr. Carl Benson (see “Meeting people in Alaska …“), where we chatted about his previous traverses on the Greenland Ice Sheet and some of his current scientific endeavors. I was fascinated with his stories as my 2011 traverse with Thomas Overly and company was still fresh in my mind. As luck would have it, the Dartmouth IGERT community continues to interact with Benson. It all started with a picture … Photo courtesy R. Benson. In December 2012, while attending the AGU science conference with Chris Polashenski, I had the fortune of meeting Betsy Turner-Bogren from ARCUS (Arctic Research Consortium of the US), and we briefly chatted about an interview concept that reminded me of my August conversation with Benson. ARCUS has a newsletter it produces, Witness the Arctic (WTA), that provides “information on current arctic research efforts and findings, significant research initiatives, national policy affecting arctic research, international activities, and profiles of institutions with major arctic research efforts.” “Arctic Generations,” a series within WTA, is where an early career scientist gets to interview a scientist with “a long, distinguished career.” I could not pass up this opportunity to bridge the ground-breaking science, research techniques, and logistics accomplished by Benson and his traverses with the 2011 Greenland Inland Traverse. You can find the interview here. While we touched on some science, I was also intent on bringing out some of his personal memories of the traverse – my favorite anecdote is about the air logistics and, in particular, the French “free drops” along the 1955 traverse. I’m not the only IGERT’eer chatting Benson up. Indeed, Chris is collaborating with Benson for his 2013 traverse of the Greenland Ice Sheet experiment (known as “SAGE”: Sunlight Absorption on the Greenland ice sheet Experiment). Recently, Chris shared his experiences and some of his initial findings at an IGERT-sponsered talk here at Dartmouth. A blog of his 2013 traverse can be found here. 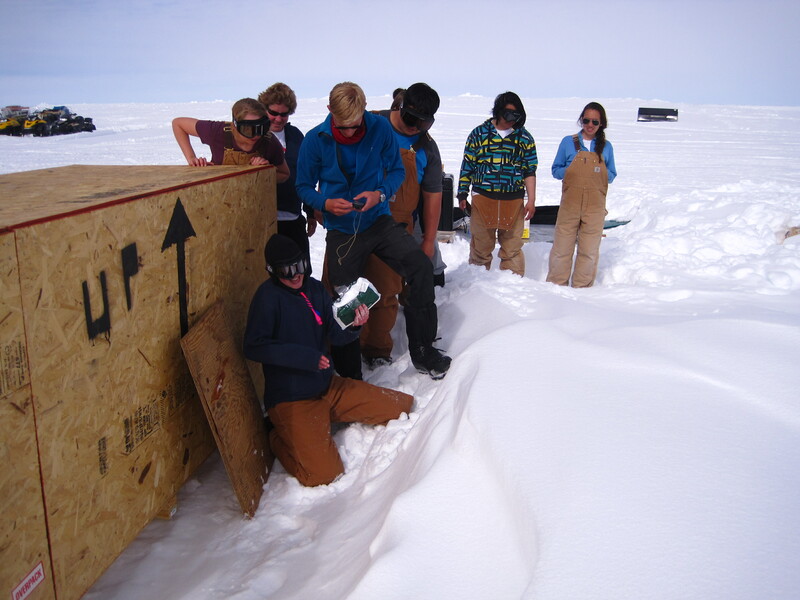 For me, this illustrates one of the neat aspects of snow and ice core science – its a very young science. What I mean by this is that many of the techniques developed and initial studies happened within the last 50-60 years, and many of those pioneering researchers are still pushing the envelope of knowledge today. The opportunity for a young scientist, like myself, to talk with giants in their field is unique. While up at Summit camp, we were fortunate to overlap with students from the Joint Science Education Project (JSEP). 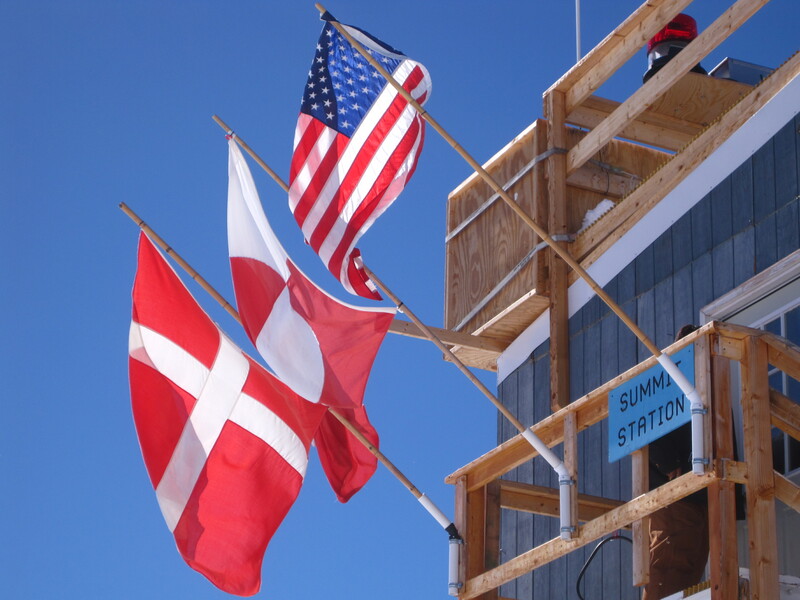 The program provides high school students from Denmark, Greenland and the United States with the opportunity to travel to Summit Station and learn about the scientific research that occurs there. 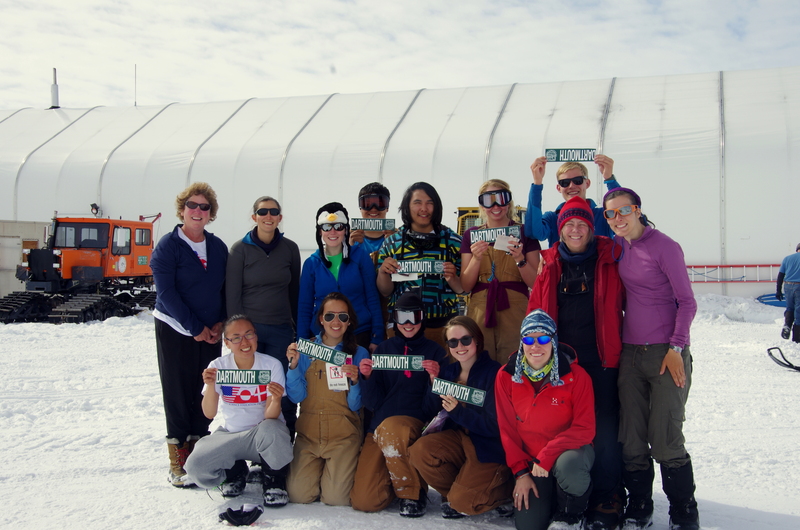 The ladies of Cohort 4 were eager to share our polar knowledge with the JSEP students, so we set up four different activities that revolved around snow and ice. Summit flies flags from all of the participating countries in the Joint Science Education Project. 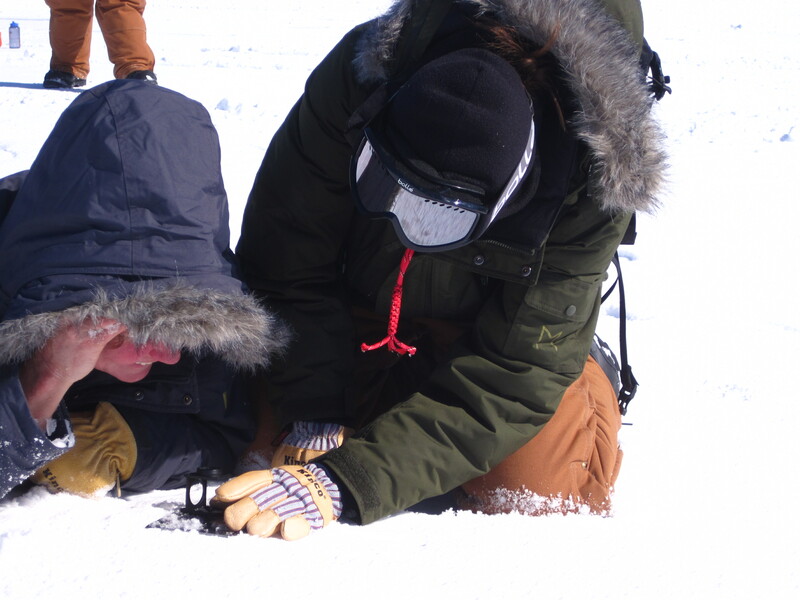 The first activity took the students out around camp to investigate snow albedo. We searched for snow that somehow looked different. For example, these differences could be due to compaction from heavy equipment, exhaust from LC-130 planes, or frost flower growth on the surface. We made measurements of albedo and used hand lenses to take a closer look at the snow grains and see how they differed from place to place. Looking at snow grains through a hand lens. One afternoon took us down to the beautiful backlit snow pit, where we discussed snow layering from different storm events and different seasons. 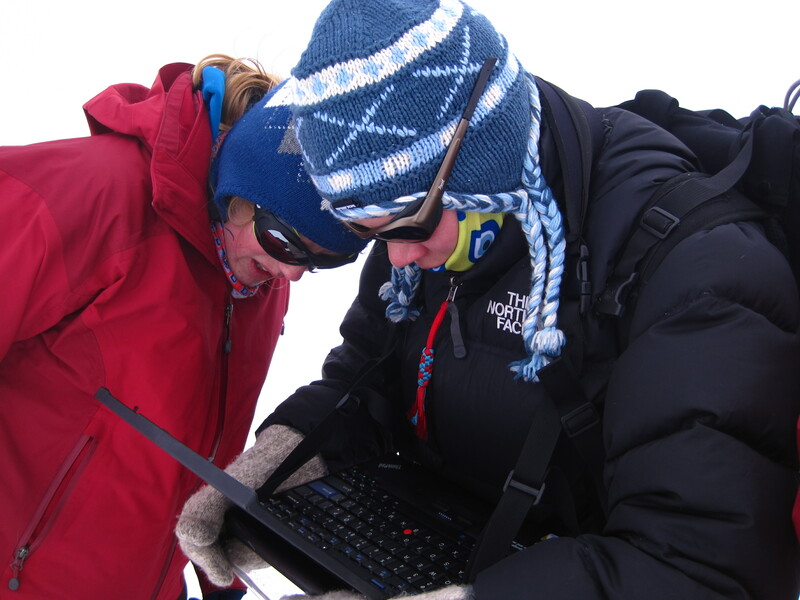 We analyzed the snow stratigraphy, made density measurements and talked about implications for ice core studies, like the research done on GISP2 right at Summit! 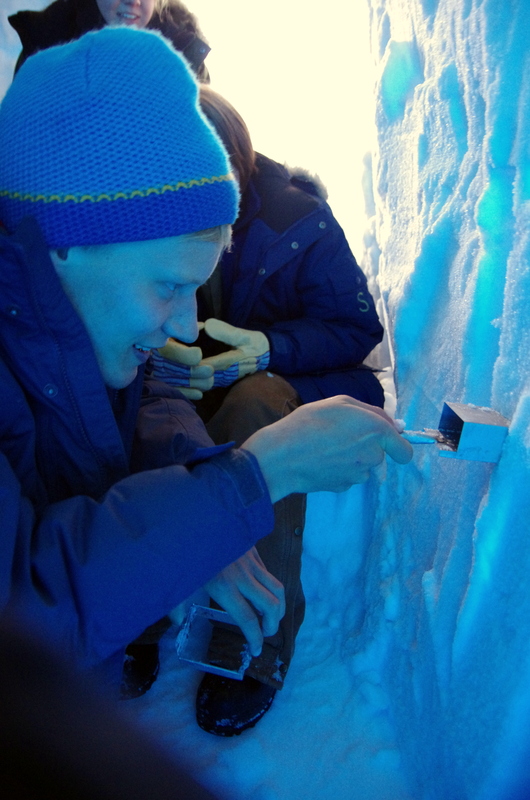 Measuring density in the backlit snow pit. 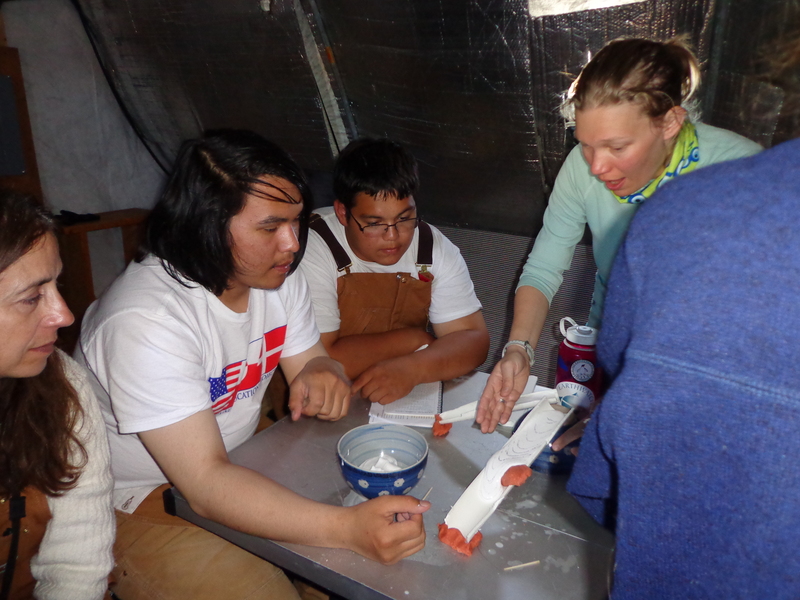 Kristin led a hands-on exercise to teach the JSEP participants about glacial flow. The students made their own flubber from glue, water and borax, and they ran experiments to determine how their flubber “glaciers” would flow under various “bedrock” conditions. A wee bit messy, but worth the clean up! Kristin explains the physics of glacial flow using flubber! Our last afternoon at Summit fell on a beautiful, warm, sunny-sky day. The JSEP students broke into teams and set out on a scavenger hunt! Using GPS coordinates or clues about things around camp, the students were led place to place until they reached a final clue that could only be solved with input from all three groups. At last, they found the long sought-after buried treasure of Summit Camp! The buried treasure of Summit Camp is found! Coveted penguin stickers in the scavenger hunt prize! When we weren’t sharing our love of science, the IGERT and JSEP teams enjoyed other activities around camp, such as singing songs together in the Big House or playing board games in the Recport. It was a fantastic opportunity for the IGERT students to share our science, to learn about science education in other countries, and to have a great time while doing it! JSEP and IGERT groups after a successful scavenger hunt! When you walk outside at Summit Station without your sunglasses, all you see is blinding white in all directions. Snow reflects so much sunlight that sunglasses and copious amounts of sunscreen are necessities at all times. The scientific term for reflectivity is albedo, or the fraction of incoming light that a surface bounces back. The albedo around Summit Station is pretty close to one; almost 100% of the incoming light bounces back (towards our vulnerable eyes and skin!). 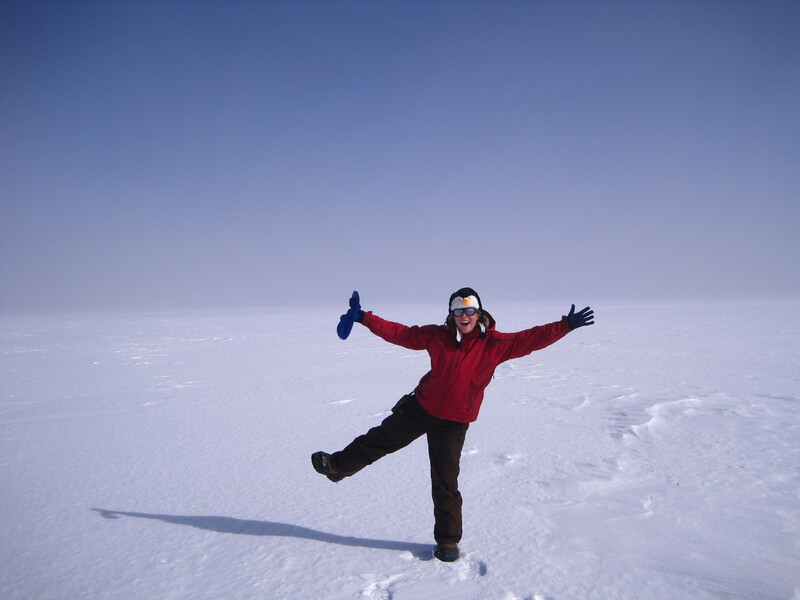 Alden in front of the great white expanse of the Greenland Ice Sheet. 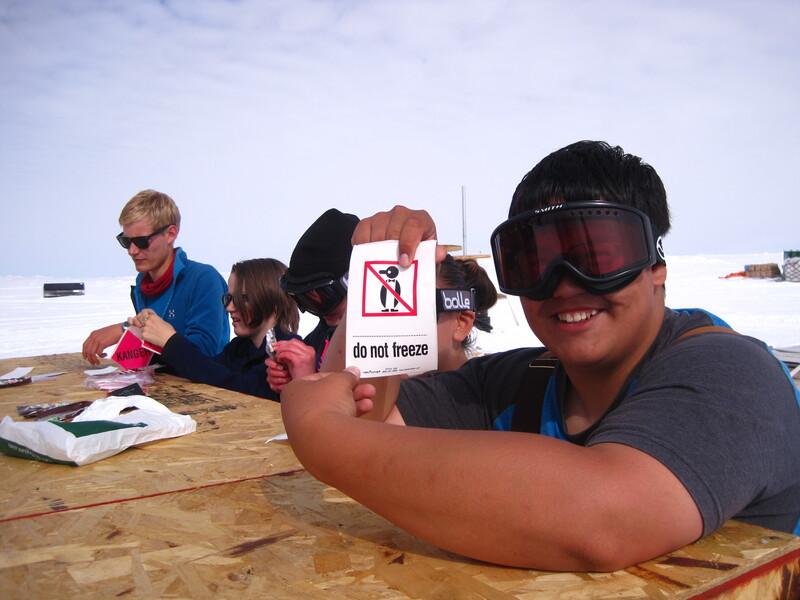 But ‘pretty close to one’ isn’t good enough for IGERT fellow Alden Adolph, who studies albedo in New Hampshire and, for the past month, at Summit Station. During the month of June, Alden made albedo measurements every day at one location, to see how albedo changed over the course of the month, and to relate albedo to other variables like grain size and snow density. While the IGERTs were at Summit, Alden took advantage of the extra hands to address a question she’s been contemplating: how does albedo vary spatially? If she takes multiple measurements at just one location, is she capturing the whole picture? Or if she moves a few meters away, would the measurement be entirely different? 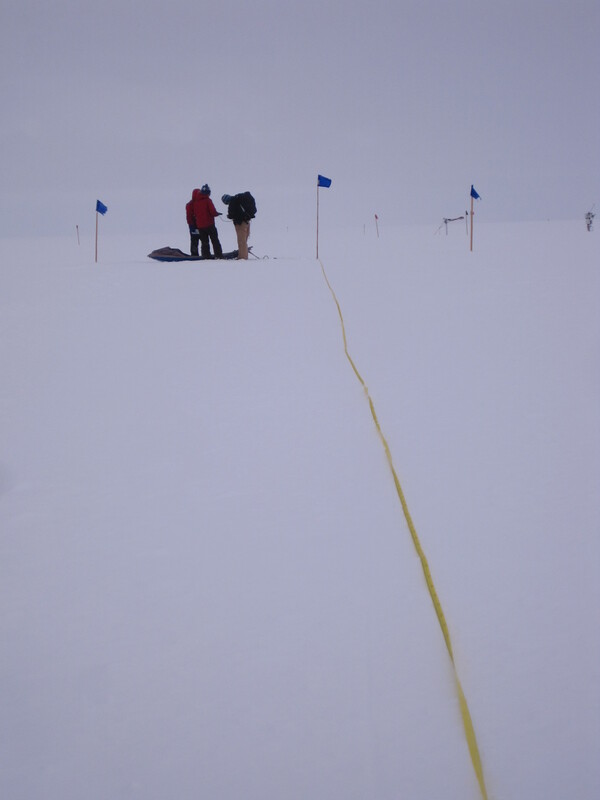 To answer this question, we set out with our handy field spectrometer, a long tape measure, and a few flags. We marked out a 50-meter by 50-meter grid on fresh, undisturbed snow. Alden, our trusty instructor, showed us how to use the instrument. Learning how to use the field spectrometer. Since albedo is the ratio of reflected to incoming light, each measurement has two parts: first we point the sensor toward the sun, then we point the sensor toward the ground. The sensor is attached to a long metal bar that needs to be level to the ground. The field spectrometer in action! Repeat two more times, move 10 meters along the transect, and repeat. At the end of our grid, we had completed more than a hundred measurements that are currently waiting for Alden to process. 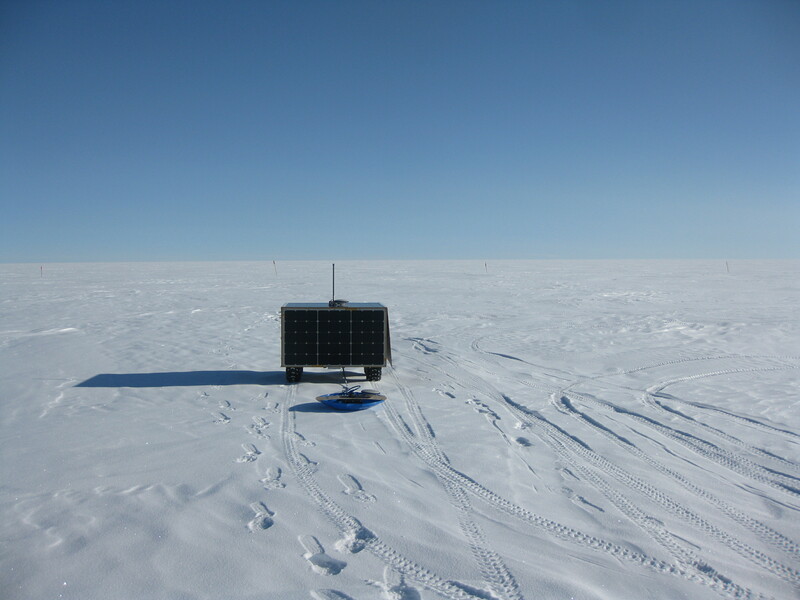 Although the surface all looks bright to our eyes, the field spectrometer will do a much better job at distinguishing small variation in the albedo at Summit. The Quest for Buried Ice Layers! Last summer, just before IGERT cohort 3 journeyed up to Summit Camp, the Greenland ice sheet experienced extensive surface melting. Much of the top layer of snow melted and dripped through the snow near the surface. But of course in the cold weather, it didn’t remain as water for very long! This water refroze in the snow, forming flat layers of ice which are connected to one another by vertical columns of ice (see the picture below for an idea of what this looks like). Since last summer, it has snowed quite a bit at Summit, so now the ice layers and the columns that connect them are buried. We would like to know what this ice layer looks like and how many of these ice columns formed in areas around Summit Camp. Now don’t get me wrong, I love digging a good snow pit, but unfortunately, we can’t dig up miles of snow. What we would like is to see what’s under the snow without having to break our backs. 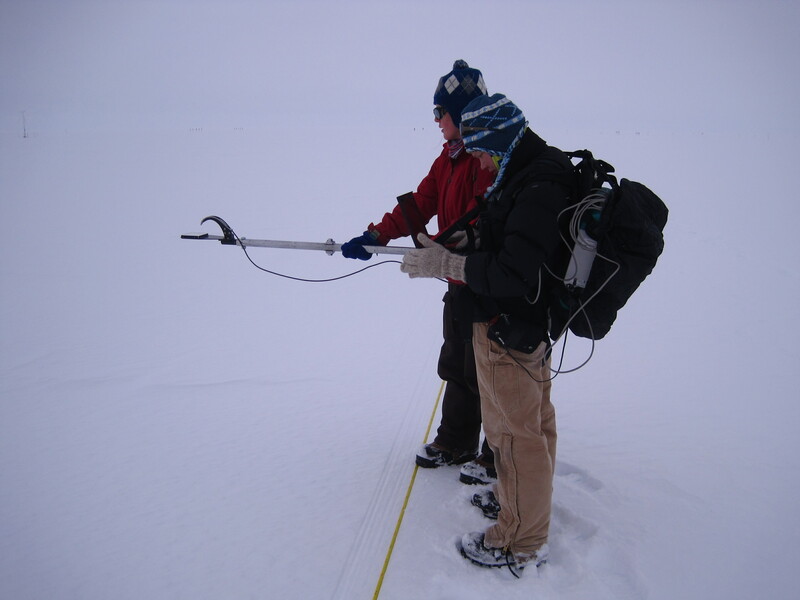 Using ground penetrating radar (GPR), we can look down below us and “see” the layers of snow upon which we stand. We can also see when there is something different in the snow, like ice which is visible because it has a much higher density. 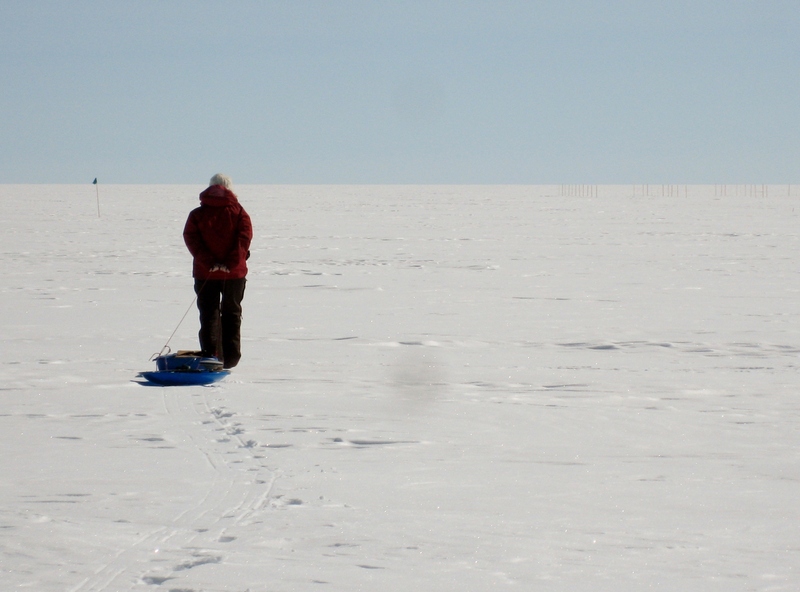 In our first week, we have spent some time getting the radar system running and testing it out by setting it in a sled and pulling it behind as we walk. One question lingered – is the radar “seeing” what we would see in real life? For that, we had to dig! We dug up a snow pit to see just how prominent the ice layer actually is and to determine if we could see any vertical ice columns. 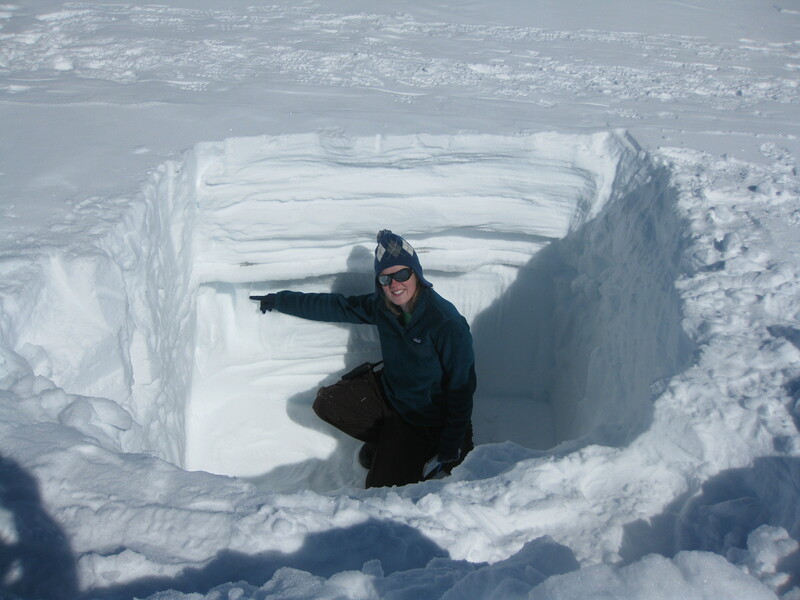 Sure enough, both the ice layer and even a vertical column were easy to find in the snow pit! During the 2012 IGERT Field Seminar in Greenland, the all-female cohort 3 was introduced to this promotional video, put out by the European Commission as a part of a campaign to inspire more young women to get involved in science. The controversial video has since been taken off the European Commission campaign website, but not before sparking some lively debate. The discussion in Greenland amongst cohort 3 about the video and the role of women in science inspired us to make our own version of Science: It’s a girl thing!. What do you think about the European Commission video and our take on women in science? Despite the controversy surrounding the video, the European Commission has a really cool website for their Science: It’s a girl thing! campaign. Check it out: http://science-girl-thing.eu/en. I admit, I can be a little nerdy at times. And, in light of my current alma mater, let us conjure Dr. Suess’s imagining of the word [If I Ran the Zoo]. This being said, my Alaska trip became a cornucopia of chance encounters and coincidental run-ins, from people who live in Boston to people I’ve worked with on Polar ice sheets! While I would like to write about all of them, I’ve whittled the “run-in” list to three: Denali National Park, Julia Gourley, and Dr. Carl Benson. Perhaps its fitting to mention Denali National Park first. It wasn’t until after I was asked to present a poster at the following week’s Week of the Arctic conference that I even thought to visit this majestic park. First established in February 1917 (as Mt. McKinley National Park), Denali NP now sits at 7,329.2 sq. miles, with an additional 2,089.9 sq. miles “buffer” in its preserve. For comparison, New Hampshire (9,279sq. miles) is slightly smaller than the whole of the park and preserve. Denali, or “The High One”, is the Athabaskan name for the mountain that serves as “the roof of the continent”*. My visit was short (day trip aboard a shuttle bus to Eielson Visitor Center), but it was punctuated by numerous animal sightings and my good friend (and shuttle driver), Dawn, that I met while working in Antarctica. I hope to re-visit this marvelous area sometime soon! 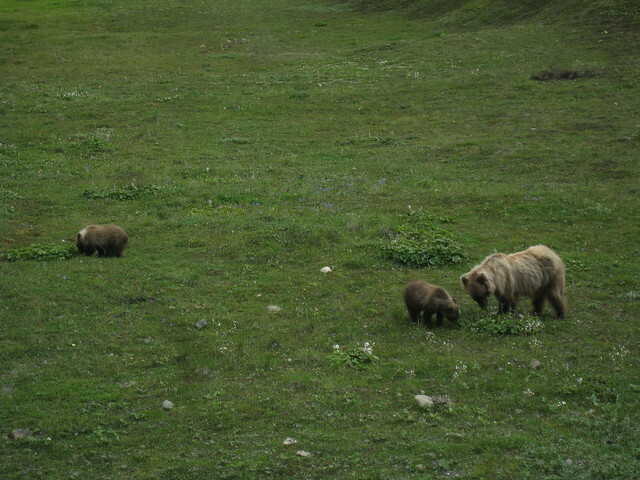 Mother grizzly with her two springer cubs. 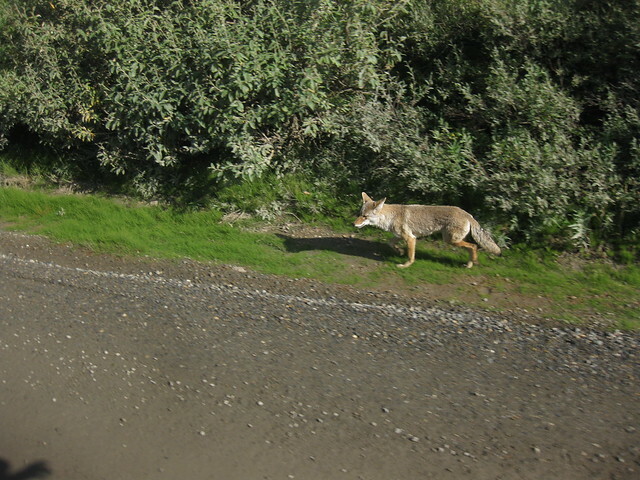 Coyote walking the road to Eielson Visitor Center. The Wednesday poster presentation was actually part of a general invitation to participate in the Institute of the North‘s Week of the Arctic. Although I did not have time to spend all week in Anchorage, I was able to participate in Tuesday’s session (Arctic Council Strategic Planning and Luncheon) where Senior Arctic Official Julia Gourley (State Department) was a speaker and guest. Her role is to help lead US foreign policy development in the Arctic, and it was fascinating to hear her explain the structure of the Arctic Council (high-level diplomatic forum for international cooperation in the Arctic with 8 member states and 6 permanent participants), illuminate some of the key issues currently facing the Arctic, and engage with the conference participants. I only got a chance to chat with her for about 10 minutes, but I invited her to come to Dartmouth and speak with our IGERT folks … let’s hope her schedule allows! Perhaps the biggest meeting of the trip, in my estimation, was my evening spent with Dr. Carl Benson (and his wife, Ruth). For those keeping score, Carl planned and led a series of traverses (1952-55) that led to his oft-read 1962 CRREL report that, among other things, defined the concept of glacier facies. Indeed, his traverses were the basis for the 2011 Greenland Inland Traverse that Thomas and I undertook last spring. What fun that was! The evening was a mix of tales of derring-do and nostalgia, from train platforms in Evanston, IL, to the great, flat white of the Greenland Ice Sheet. Perhaps most fortunately, Carl delved into some of the glaciological questions that he’s still thinking about … a treasure trove indeed! With luck, I’ll be able to incorporate some of his curiosity into my still-developing thesis! Thanks for a wonderful night, Carl and Ruth! And thanks, IGERT, for a wonderfully opportunistic Alaskan trip! A picture with a legend! Photo courtesy R. Benson.